When I think about Hungarian goulash soup I always make a virtual trip in my mind back to my childhood. My grandmother has made lots of from this traditional and very tasty Hungarian soup. As I have promised on our Hungarian food page I will show you here what the difference is between Hungarian goulash soup and Hungarian goulash. I tell you the secret right now in the beginning as I don’t want keep you excited for too long, and this secret is very simple. The main difference is: the Hungarian goulash soup is a soup with meat and lots of vegetables and Hungarian goulash is a kind of stewed meat without vegetables. 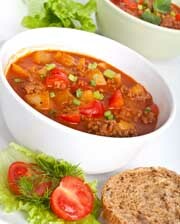 Basically the main ingredients of the soup are similar to goulash (meat, onion, paprika etc.) but for the goulash soup you should add some additional vegetables. 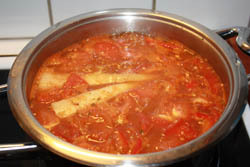 For both Hungarian foods the most important ingredient is Hungarian paprika. What Ingredients do you need (for 6-8 people)? First of all you have to wash the meat and slice it around 2x2 cm (1x1”)cubes, then clean the onion and slice it as well. Heat up the oil and when it is hot, fry the sliced onion in it until it gets glass like color (wilted). Take the pot off the stove and add the paprika and the meat. Fry all together for couple of minutes on high temperature. 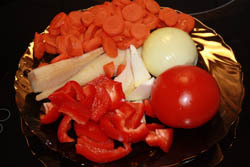 Add the earlier sliced paprika, tomato (the best to slice them in small cubes) and put in the stock and salt. Cook everything in their juice for 45 minutes on low temperature. While the meat is stewing, clean the potato and vegetables and slice them on small cubes. 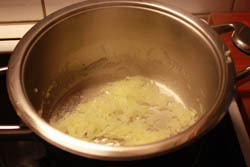 Add 2.5 liter (2.6 quarts) water, put the vegetables and potato into the pot and add the caraway seed and cook for 20 minutes with the lid on. During these 20 minutes you make Galuska / Little Pinched Dumplings as I described on the Hungarian goulash page (you just need to make the dough of galuska). 5 minutes before the soup is ready, put the galuska in the soup. 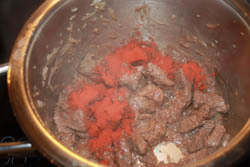 When the galuska is ready, take the Hungarian goulash soup away from the stove and add the ground pepper to it. If you find the soup too thick, you can add more water. 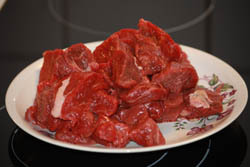 You can make also Hungarian goulash soup from chicken or lamb. You have to take into account that the cooking time will be different, e.g chicken needs less time. I hope you enjoyed the cooking of this traditional Hungarian food. If you want to share your cooking story with us or you just need some help, please don’t hesitate to contact us.